Creed is the youth centric brand which believes in rendering quality sunglasses at affordable price. The brand is known for its peppy style, glam look lenses. There is a freshness in design and appeal in the sunglasses offered from creed. The lens is made up of polycarbonate material whereas frame is composed of metal. It provides toughness and durability to the glasses. your face and look and will give protection to your eyes against sun. Creed is the youth centric brand which believes in rendering quality sunglasses at affordable price. The brand is known for its peppy style, glam look lenses. There is a freshness in design and appeal in the sunglasses offered from creed. The lens is made up of polycarbonate material whereas frame is composed of metal. It provides toughness and durability to the glasses. You can easily pick the best one and flaunt it with formal or casual dresses both. 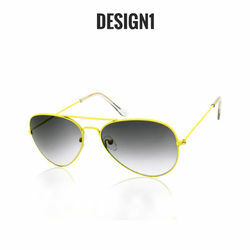 So get the best one that suits well with your face and look and will give protection to your eyes against sun. Product color may slightly vary due to photographic lighting or due to your monitor settings.